Brodleians Colts U18s in action against Wharfedale on Saturday, a game that maintained their impressive run. With no senior games on Saturday due to waterlogged pitches the focus switched to the Juniors on Sunday and in particular the Under 19s senior colts side who are enjoying another exceptional season. The team, coached by Gary Wilson and former Halifax RL star Scott Wilson (no relation) are battling for silverware on three fronts and a large crowd gathered on Beaver Park to support the team which considering the appalling conditions the day before had drained well to allow the game to take place. And Brods Colts continued their good run of form with another home victory, 24 points to seven, in the Yorkshire Premiership. 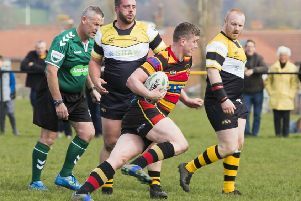 With an unbeaten run of 11 victories under their belt their treble charge is well underway and on Sunday the objective was victory in the league against fourth-placed Wharfedale. Having won the toss they elected to play up the slope, however, they did have some help from a strong wind blowing diagonally across Beaver park . Brods defence looked strong from the start and they worked their way uphill as they dominated possession. A good kicking game directed by Tom Wilson and Jimmy Hodgkinson gave the home side good field position and on 20 minutes Brods pressure earned its reward when a quickly-taken tap penalty was moved swiftly through hands to the right wing where George Ramsey finished in fine style for a 5-0 lead. Brods continued to dominate with Miles Watson and Will McLuaghlin doing outstanding work in the loose. Watson’s hard work was rewarded when he broke several tackles to score on 25 minutes and give an opportunity for Wilson to convert from near the posts. The 12-0 lead at half-time was due reward for a good all- round display and with the slope now to their advantage Brods set about completing the job. This they did in fine style when a Wilson break was finished by the strength and determination of Connor Pollard on the left. Pollard duly completed an excellent display with his second try scored in similar style which also earned his side a bonus point . Wharfedale finished the scoring in the close seconds with a fine individual effort from their right winger who ran the length of the field to finish under the posts . The result leaves Brods just four points behind tleaders Doncaster but with two games in hand over the leaders and with Doncaster still to come to Brods. Brods return to cup action next week when they meet Scunthorpe in the quarter- final of the Yorkshire Cup at Woodhead (1.00pm). They will be then play Nottingham Corsairs on February 21 in the quarter-final of the National Cup . These are exciting times indeed for the young Hipperholme side.